Hopefuls entering the restaurant include media student Dan who wants to try new things. 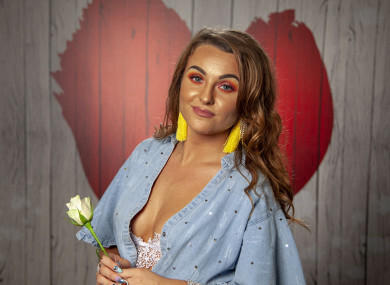 Can fellow Dubliner Rachel tempt him with her passion for blue cheese? Other singletons up for romance are a three-times engaged interior designer, a salsa-dancing tax accountant, a bubbly children’s entertainer and a Limerick guy with a girl’s name. Intriguing. New series. A year in the life of four GAA clubs, beginning as the supporters of Cumann Caide na Gaeltachta travel to their All Ireland semi-final match against Moy Tír na nÓg from Tyrone. In Conamara the Liam McCarthy Cup arrives at CLG na Piarsaigh clubhouse as their under-eight team begin their first training session of the season, while preparations begin on and off the field at CLG Na Dúnaibh, as they will host the Comórtas Peile na Gaeltachta finals in June. There’s speculation that the former Westlife star might pull out of Dancing On Ice after dislocating his shoulder and injuring his back early on in the series. Guess we’ll just have to wait and see what happens on Sunday! Hunted (Channel 4, 9.00pm) The cat-and-mouse game continues. Back In Time For School (BBC Two, 8.00pm) Brit teachers go back to the ’70s to suss the curriculum. Bridget and Eamon (RTÉ Two, 10.30pm) When Bridget goes into hospital, Eamon mistakes a random woman as his wife and she moves in, leaving the real Bridget making an epic journey home to reclaim her place by his side.